Synopsis: It's 1347 and fifteen-year-old Will, an orphan boy, lives at Crowfield Abbey. Sent into the forest to gather wood, he rescues instead, a creature from a trap - a hob, who shares with Will a terrible secret. Somewhere in the forest behind the abbey where he lives,is a grave. And buried deep in the snow is an angel. But how can an angel die? What has it to do with the monks of the Abbey? When two hooded strangers arrive at Crowfield asking questions about the angel's grave. Will is drawn into a world of dangerous Old Magic. The Crowfield Feather was short-listed for the Times Chidren's Fiction Competition in 2008. This is a stunning debut novel and the first of a two part series. The Crowfield Curse is Pat Walsh’s debut novel, aimed at 9-12 year olds. It’s historical fantasy with a debut twist, and for what it offers, it is surprisingly good. 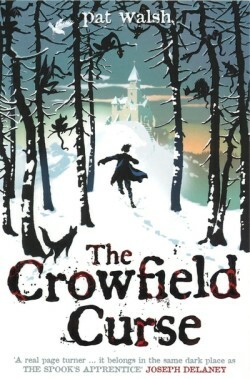 Set in what seems to be medieval Britain (the year is 1347), The Crowfield Curse is set in a rather unusual time period. It’s not often you get books aimed at 9-12s set in an Abbey, and much less one 700 years ago, but Pat Walsh manages to convincingly describe Will’s world. Details don’t spill out of pages paragraph after paragraph, but there are enough to successfully paint the surroundings and the action in a way that is more than fitting for a book aimed at the pre-teen market. Although it’s William who is presented as the main character throughout the novel, it is the hob, ‘Brother Walter’, who is most easy to connect with. He’s wonderfully endearing and manages to steal the whole book with his oddly intelligent and yet cute dialogue. William himself seems an odd character; while Pat Walsh has made him 14, some of his behaviour is not that of his age, and somehow he doesn’t make himself a very easy character to relate to. Shadlok, another major character, seems overplayed, and his unintentional mood swings were odd and didn’t gel with the rest of the characters. For the most, the rest of the characters were well developed, with a sense of mystery that bodes very well for the story. The story itself is quite predictable. At this point, it is easy to tell that it was written for pre-teens: the simple plot line is not complicated. Particularly impressive is the way Walsh manages to combine the more fantasy elements with the realistic Christian elements. Simple the plot may be, The Crowfield Curse is still a great, light read. As a whole, The Crowfield Curse is presented as an enjoyable read. The atmospheric descriptions together with the beautiful cover really paint the setting, and I’m sure 9-10 year old boys in particular will really enjoy this novel. If you’re older and just looking for a light, historical fantasy, then this is also a great read.